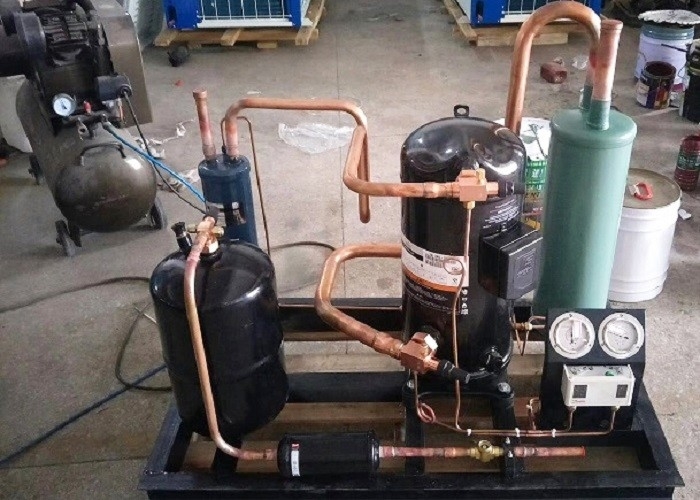 Our Company Guangzhou Xiangbingyue Refrigeration Equipment Co., Ltd. offers the highest energy efficiency available in a standard unit to lower utility bills for operators . Ranging in size from 1.5 – 6 HP , the units are perfectly suited for walk - in cooler and freezer applications . These units combine the latest Copeland Scroll™ compressor technology , variable speed fan motor control , large condenser coils, and a high efficiency fan blade design to deliver up to 40% higher annual energy efficiency when compared to standard industry offerings . The Copeland Scroll™ Outdoor Refrigeration Unit is designed for medium - and low-temperature , walk - in coolers , freezers and display cases commonly found in c - stores and restaurants . With its best - in - class energy efficiency , slim profile , ultra- low sound levels , superior diagnostics and built - in protection , it delivers reliable commercial refrigeration while solving many of today ’ s small - format retailer challenges . Each refrigeration system has its rightful place in the food service industry , depending on the specific application and the facility ’ s unique operating criteria . Recent advances in OCU technology have strengthened the case for choosing outdoor condensing units over self - contained or rack systems .